Prejudice exists in many forms. People often discriminate against one another based on race, religion, weight, gender, and more. 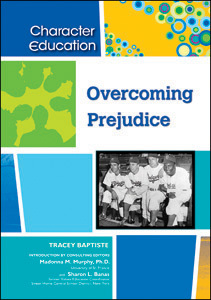 Offering an in-depth explanation of how and why prejudice exists, Overcoming Prejudice provides readers with multiple true stories of people who have faced various prejudices and describes how they dealt with it. A final chapter gives readers tips for how to improve their communication skills and prevent stereotyping in their communities. Tracey Baptiste is the author of the young adult novel Angel’s Grace, which was named one of the 100 Best Books for Reading and Sharing in 2005 by New York City public librarians. For Chelsea House, she wrote Being a Leader and Making Decisions in the Character Education series.